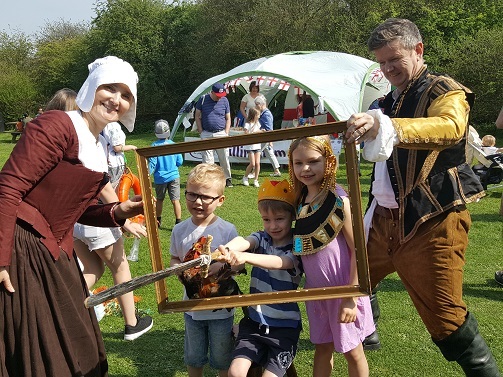 Celebrating St George’s Day, The English Festival returns with a fun-packed day out for the whole family celebrating the most iconic and ironic of English traditions. This year we are pleased to announce that the beach is back, so bring your bucket and spade and get ready for a whole range of traditional English seaside activities. From building sandcastles, donkey rides to a helter skelter ride, there’s something for everyone to enjoy. The English Festival also falls on the Easter weekend this year, so get ready for Easter egg hunts and much more! And best of all, you can enjoy an array of activities all in one place! Park and ride: £1 per person (return). Children under 16 go free. From Greenwich University – look for the yellow park and ride signs. It runs from 10am to 6pm. Park and walk: £3 per vehicle at Bloors Wharf (bottom of Bloors Lane, off Lower Rainham Road) and enjoy a pleasant 15 minute walk to the event along the river path. Parking on site: £5 (limited spaces available). Parking will be aimed primarily at blue badge holders. Bus: Riverside Country Park is covered under the Medway bus routes. Please note that the Saturday bus service does not enter the Riverside Country Park site. We hope you always enjoy The English Festival. Please tell us what you thought of the event so we can make sure we continue to improve.